During Holy Week I am posting on several poems which take me deeper into Holy Week. A couple of weeks ago, while reading through George Macleod's papers at the National Library of Scotland, I came across a number of typed poems. Macleod, the founder of the Iona Community, wrote some original poetry - but the one quoted here isn't one of them. There is a slim folder with poems copied from elsewhere, clearly important to Macleod. Given his hostility to nuclear weapons and his profound theology of creation, incarnation and redemption, he developed a theological rationale for his anti-nuclear position. To split the atom, the constituent parts of reality, in order to release energy for purposes of human destruction, was for Macleod blasphemy. In creation, incarnation and redemption, matter became sacramental. The following poem, read during Holy Week, explains something of Macleod's passion, and I use the word in both senses - emotional intensity and personal suffering. Few Kirk ministers approached Holy Week with more solemnity, or imbued it with more unsettling mystery. 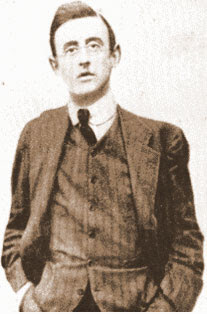 Part of the ambiguity and tangle of human affairs is that the poet of this remarkable poem (pictured above), was a signatory of the Declaration of the Irish Republic in 1916, a writer of such beautiful and spiritual perceptiveness, was executed for treason by the British Army, and at the time Macleod would have approved. Following the First War Macleod became a convinced pacifist and took time to type out this poem, written by an Irish Republican, whose spiritual vision of nature as sacrament of God paralleled Macleod's own deep sense of God's costly entanglement with His creation. by Joseph Mary Plunkett (1887-1916).